Is poor data storage management putting you through "network hell?" Perhaps a software-based storage management solution can save you. As I was writing this article, Northern Parklife released a Quota Server update, making the server service Win2K-compatible. Great timing for this article, but it’s almost six months since Win2K’s introduction--too long to wait for a fairly simple upgrade. Quota Server provides similar functionality to other storage-management tools. In a nutshell, it helps you configure drive space quotas and alerts you if these quotas are exceeded. Quotas can be as simple as watching the space consumed in a drive or directory. You can configure Quota Server to monitor the entire space consumed by all users or just watch a particular user’s consumption. If a given threshold is reached, you can have it alert you and/or the user; if you’re really serious about disk usage, the Interception Engine can interrupt the writing of a user’s file. Quota Server is an enterprise storage-management tool. This means you can simultaneously monitor storage attached to many computers. You navigate users and computers on your network using the familiar tree structure employed by the Win2K MMC utilities. Quota Server makes it easy to deploy agents across your network using the Remote Installation Wizard. By simply choosing servers from a list and providing several configuration settings, you can install Quota Server agents on all network systems. Quota Server will generate reports for you on a regular basis or on demand. While functional, these reports aren’t aesthetically pleasing. You won’t find any pretty pie charts or bar graphs here. Instead, you’ll simply get HTML tables, as shown in the figure. So, for example, Quota Server can be used to automatically generate HTML pages within your Internet Information Server directory. This allows you to view, with a browser, server disk utilization across your network. Quota Server also can drop report data into a database table, so you can perform further processing on the information. 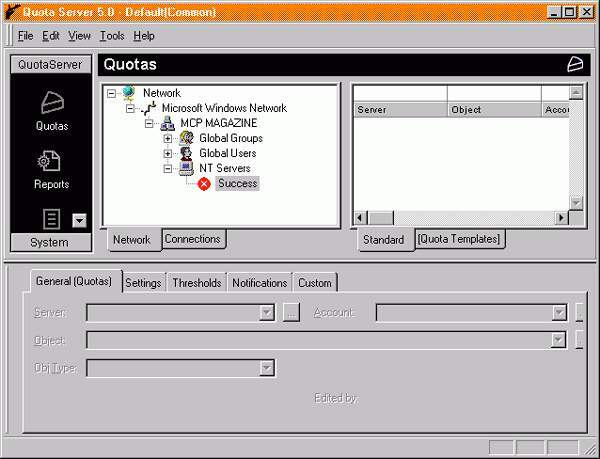 Quota Server is a useful product, but it’s not as refined as software packages from larger companies such as Microsoft. For example, it allows reports to be automatically generated and emailed to users in HTML format. It doesn’t, however, send an email in HTML format; it attaches a text file with the HTML report. So, you have to save the text to a file and open it in a browser. It’s useful, but not what I expected. Furthermore, the online help files are practically useless. They’re disorganized and difficult to read. Fortunately, the user’s manual is very readable. Still, in the end, Quota Server is a great choice if you want to manage disk utilization on numerous file servers and user desktops.